Month-long free treatment service by Obstetrics and Gynecology Department of Ad-din Barrister Rafique-Ul Haq Hospital was inaugurated on Saturday. The inauguration ceremony was held at Postogola in the capital. The service will continue from 8:00 am to 8:00 pm every day till April 16. Gynecological treatments, including cheek-up on pregnant mothers, natural delivery services, caesarean delivery and other services have been arranged under the program. Ad-din Hospital will bear the cost of the admission of the patients, bed services and fooding. Only pregnant mothers are eligible to receive the services after competition of registration at a very cheap cost. 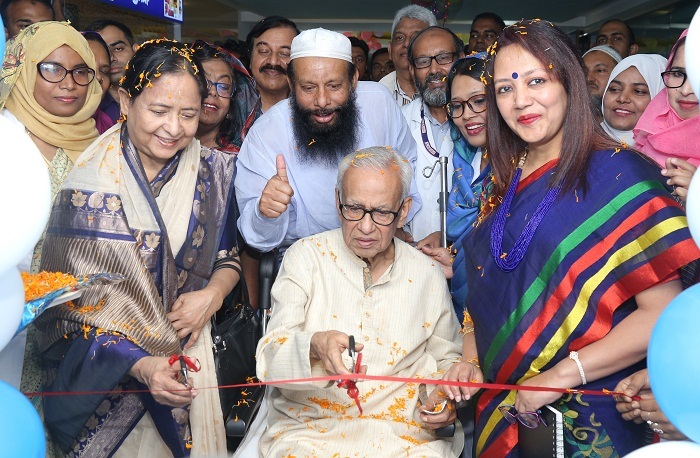 Barrister Rafique-Ul Haq, the chairman of Ad-din Foundation and a senior lawyer of Bangladesh Supreme Court was present as the chief guest at the ceremony. Executive director of Ad-din Foundation Dr. Sheikh Mohiuddin, Ad-din Foundation Medical Education and Regulatory Affairs director Dr. Md. Anwar Hossain Munshi, principal of Ad-din Women’s Medical College Dr. Afiqur Rahman, prominent obstetrics and gynecology specialist and professor of Ad-din Women’s College Dr. Anwara Begum, Director of Ad-din Foundation-run hospitals Dr. Nahid Yasmin, director of Ad-din Barrister Rafique-Ul Haq Hospital Dr. Mohammad Jahangir and deputy director Dr. Mahfuza Jesmin and other senior officials of Ad-din foundation were also present at the ceremony. “Ad-din Hospital is an open platform for medical treatment. People praise it as they get proper treatment in our hospital. Hospital authorities and doctors have to treat the people prioritising service-oriented mentality. You shouldn’t be proud of treating people, rather, you should be proud of the fact that people are giving you the chance to treat them,” Barrister Rafique said while addressing as the chief guest of the ceremony. A number of patients expressed their satisfaction getting free treatment of Ad-din Hospital. They informed that they received quality services at the hospital. Mentionable that eye treatment including cataract operation was conducted from December 15, last year to January 15, this year as part of the year-long free treatment of Ad-din hospital. Nearly, 4000 patients received treatment at outdoor of the hospital. Among those, cataract operations were conducted on 488 patients at free of cost. Some 3082 patients received physiotherapy treatment. In addition, some 1110 patients received free treatment at ENT department from February 16 to February 28. Of those, 75 patients were selected for operation and operation was conducted on 50 patients.